Open Road to Death Valley! On-the-road weather has always fascinated me. A weather radio can ALWAYS be found in any of my road trip vehicles, and I try to look at the NOAA weather satellite imagery a least once a day when I am at the office. On August 15, 2004, I noticed a huge thunderstorm cell building over the mountains on the eastern edge of Death Valley. Rain of any consequence is always of interest when it falls on one of the driest mountain ranges in North America, but this one looked especially intense. It was. The storm that began to flood the dry gullies just to the east of Furnace Creek became known as the "storm of the century" and unleashed torrents of water that eventually led the death of two motorists whose car was washed off of state highway 190 near the entrance of the popular Twenty-Mule Team Canyon Road. 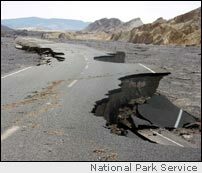 The storm waters completely wiped out nearly three miles of the state highway and caused extensive damage to both paved and dirt roads throughout the eastern sections of Death Valley National Park. 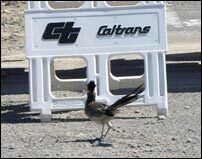 One of our long-term road correspondents, Mark Holloway, was working for the park highway department at the time. 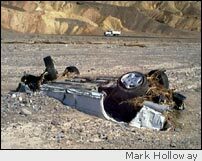 He provided us with dramatic photographs of some of the damage, including photos of some of the eight cars that were swept out of the employee parking lot and washed down the canyon in front of the historic Furnace Creek Inn. This section of State Route 190 between the Badwater Road junction and State Route 127 at Death Valley Junction is one of the most popular paved roads in the park. It provides access to Dante's View, the Twenty-Mule Team Canyon Drive, Echo Canyon, and Zabriskie Point, which probably has the distinction of the most-photographed feature in this 7,200 square mile preserve. 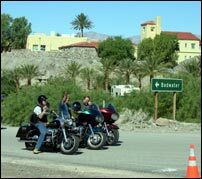 We frequently recommend using this state highway to anyone wishing to visit Death Valley starting from either Las Vegas or California. From our office, it is almost exactly 180 miles to Furnace Creek using this route, while the alternative highways can easily increase this distance by 100 miles. Because we love visiting Death Valley, the closure of this vital highway was of keen interest to us at RoadTrip America.